If you are using a diesel engine over conventional gas, you know the need for high performance and reliability. An engine is made up of smaller parts working as a team to achieve results. If one part of the team is not working properly, the overall performance of the engine can suffer. With our wide selection of affordable, high-quality diesel parts, you can get the performance you deserve with every turn of the key. We know what a hassle it can be to search for the right parts to match your engine. We aim to make things a little easier by offering a diverse collection of diesel parts so that you can get the perfect hardware for your needs. 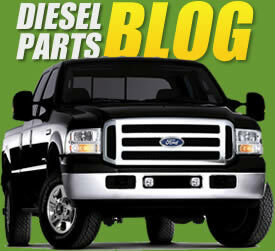 Find parts for the Powerstroke, Cummins, Duramax, Navistar, Mercedes, Dodge, Volvo, Sprinter, and more. We offer a wide selection of the most-needed essentials such as glow plugs, tiny parts required for warming up the engine, for the above-listed models. When your engine needs to take in more air to mix with gasoline for the powerful get-up-and-go you expect from a diesel engine, we have the best selection of engine intake manifolds for Ford, International, and Navistar engines. Whether looking for injector control pressure sensors to bring the heat or cooler hoses and cooler clamps to keep engines from overheating, we have the best selection of reliable diesel parts to help keep your engine roaring along like new. There is no need to spend a lot of time and stress shopping around for the parts you need for your vehicle, we can help make the job quick and easy so you can make repairs and replacements and get back to work. There are many common issues among different diesel parts. Many manufacturers have flawed designs that fail to live up to the highest expectations. Our remanufactured parts are constructed of the highest quality materials to ensure long-lasting durability and reliability. We have addressed many industry-wide issues facing various parts to ensure you get nothing but the best for your vehicle. Take advantage of our great lineup of performance diesel parts including turbo assemblies, fuel injectors, EGR coolers, water pumps, filters, sensors, and more. This cooler will the last cooler you will ever have to replace on Your Internatinal truck. This is the strongest EGR Cooler on the market today. The TamerX Diesel EGR Cooler Lastes Longer , works better and has a lower operating cost than any other EGR Cooler. Their are cheaper EGR Coolers available today. In the long run The TamerX Diesel Product will save you money. TamerX has earned the reputation as the absolute best EGR Cooler bar nun. TamerX Diesel EGR Coolers use a priority internal baffle design. The baffling insures the most efficent transfer of heat. The Inner core is made from Stainless steel Tubing. The entire EGR Cooler is assembled using a TIG Welding process designed specifcally for each EGR Cooler. The stainless steel TIG Welded tube style EGR Cooler has proven to be the absolute best. They are assembled in USA by Skilled craftman trained specifically for this JOB. Don't settle for anything less! !